1.1. 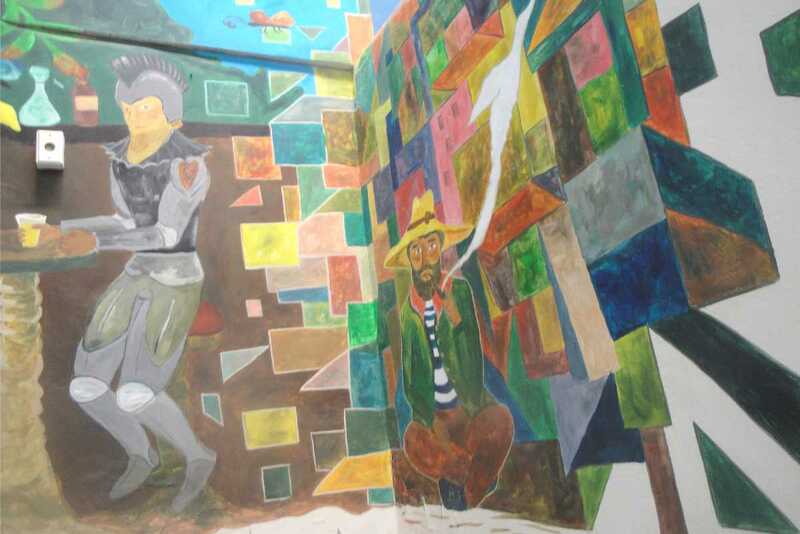 Project History: On its premises, the EDEAQ is realising the largest wall painting (“mural”) in South America (pictures 01, 02, 03, 04, 05). 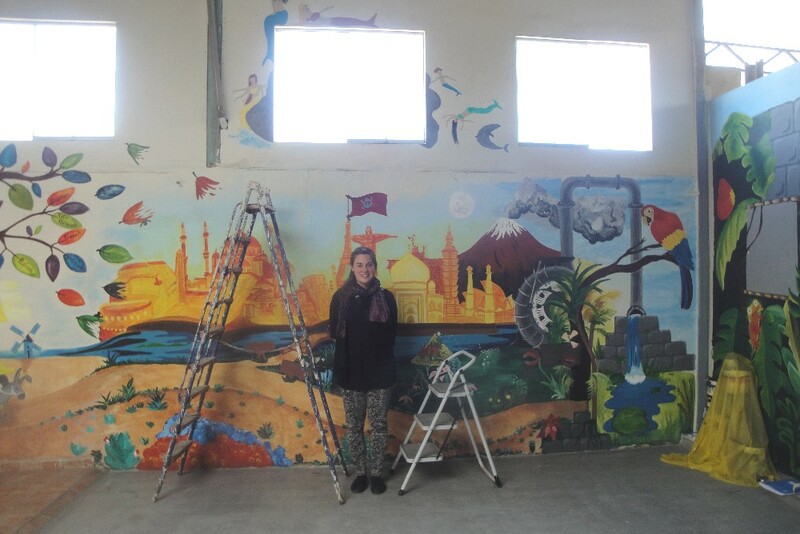 An art class of the German College (Colegio Max Uhle) in Arequipa started the project in 2014 (picture 06). Recently students from Germany and Switzerland continued (pictures 07a, 07b, 07c). 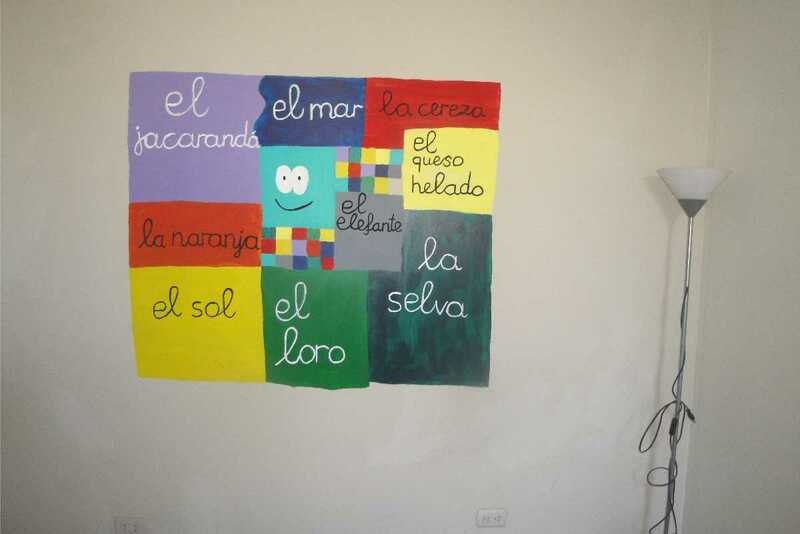 – Project Description (+ pending works): The EDEAQ is seeking talented amateur artistic painters (professionals are also welcome) to complete the work in progress and/or initiate (and possibly add to the artistic concept) the missing 35% of the “mural” (picture 08). – Remuneration: per 10 school hours, 7 of them have to be paid in cash. 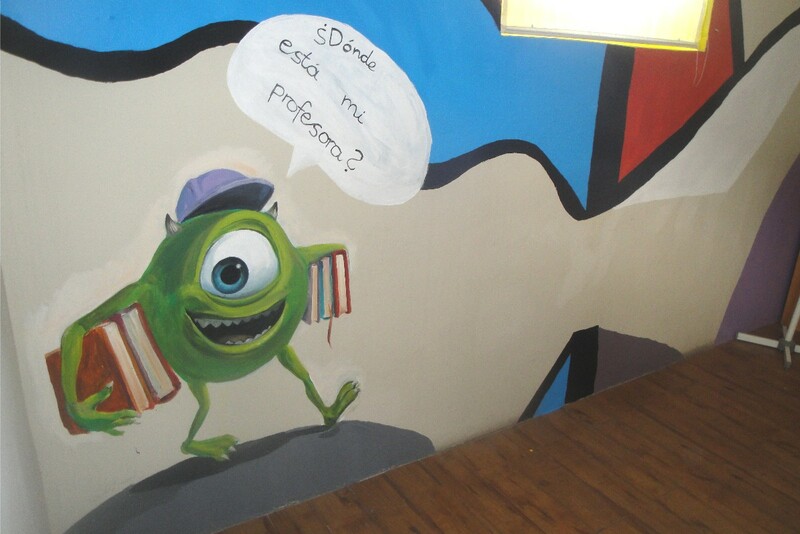 The student will compensate the remaining 3 hours by working/painting 6 hours. 1.2. 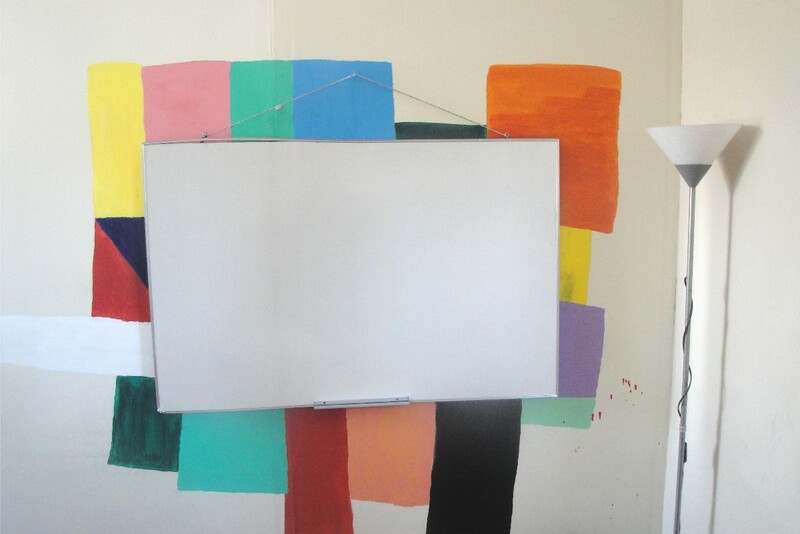 Project History: EDEAQ’s classroom walls are blank, of solid colours (white or beige). 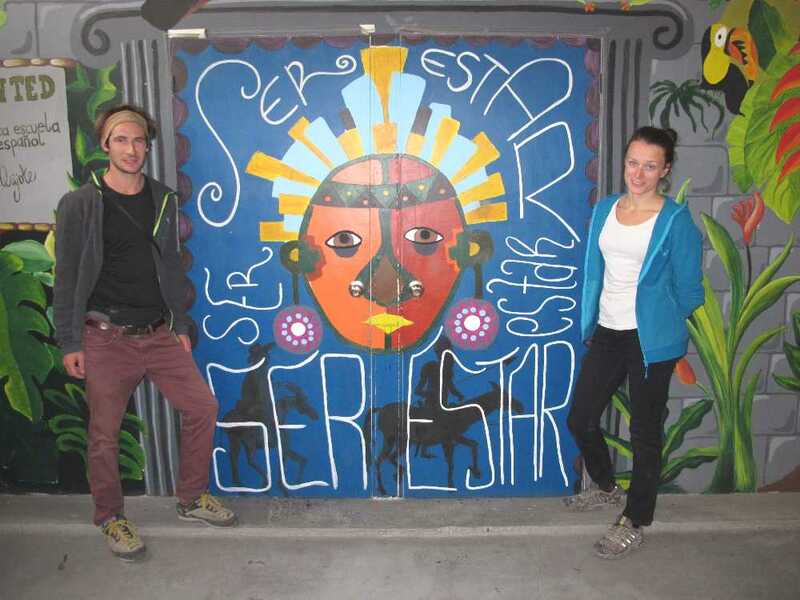 We would like to create a livelier, more stimulating atmosphere for our students. – Project Description (+ pending works): Each classroom will have a theme related to typical features of a (contemporary) artist. Who Are They? – click here. The idea is not to “copy” the originals, but to paraphrase them with an ironic twist. 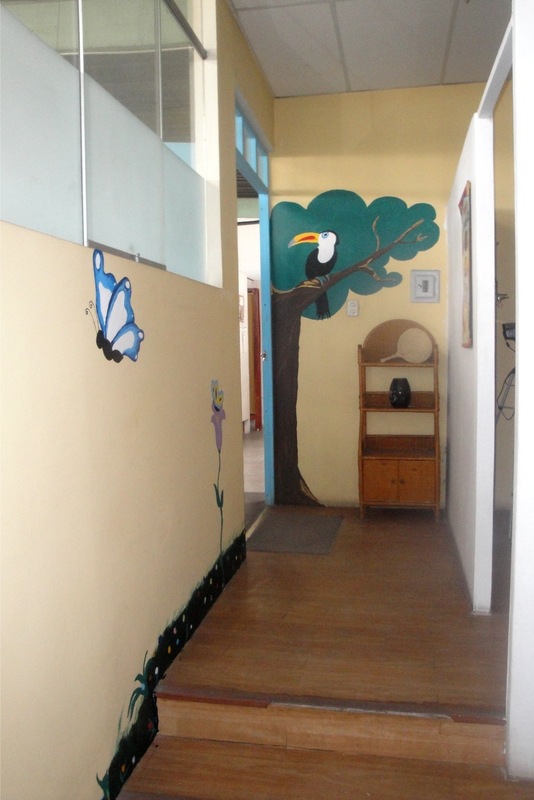 In late 2015, Sabrina K. (one of our students from Germany) redesigned and reshaped, with imagination and colours, three classrooms plus the office/classroom of the Acting Managing Director (pictures 09a, 09b, 09c, 09d, 09e, 09f, 09g). – Remuneration: per 10 school hours, 7 of them have to be paid in cash. 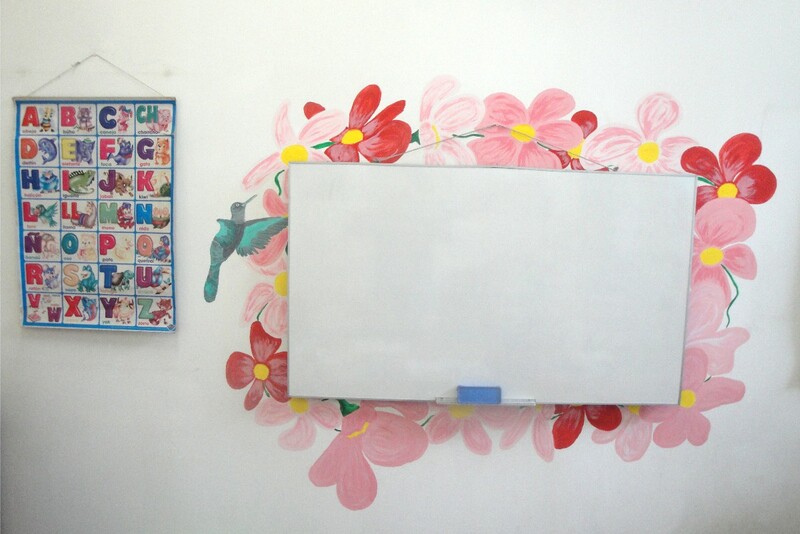 The student will compensate the remaining 3 hours by working/painting 6 hours. 1.3. 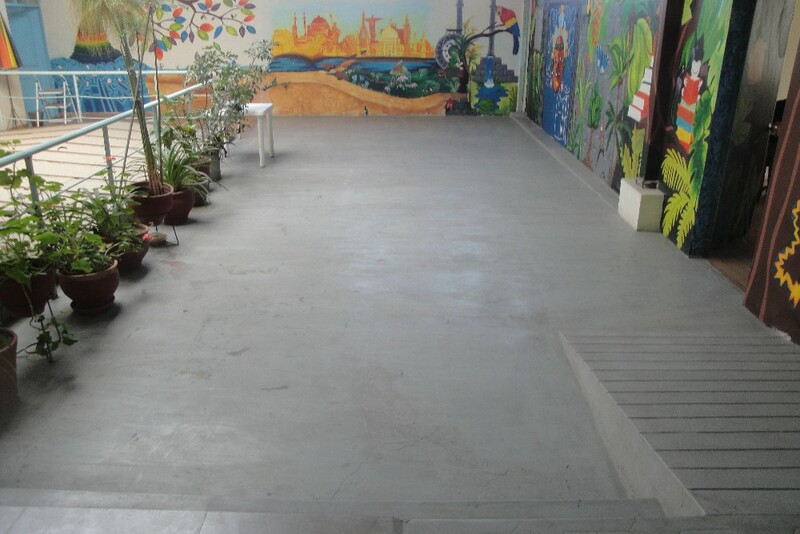 Project History: EDEAQ’s premises include large floors (pictures 10a and 10b). 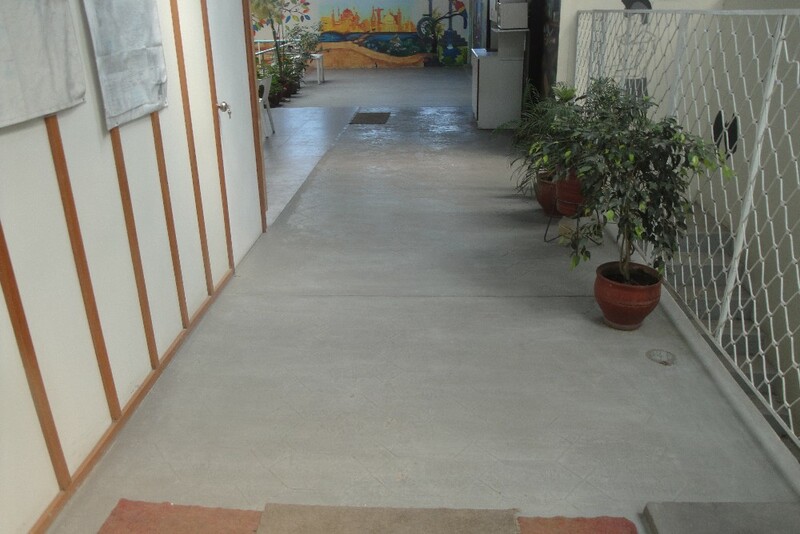 We believe that the floors ought to be painted, artistically! – Project Description (+ pending works): “l’imagination au pouvoir! !” / “All Power to ther Imagination!” The floor should be in “harmonious contrast” to the wall painting, i.e. light, discreet colours and subtle designs – nevertheless, including some 3D-painting elements should be taken into consideration. The EDEAQ has already developed some ideas. – Remuneration: per 10 school hours, 7 of them have to be paid in cash. 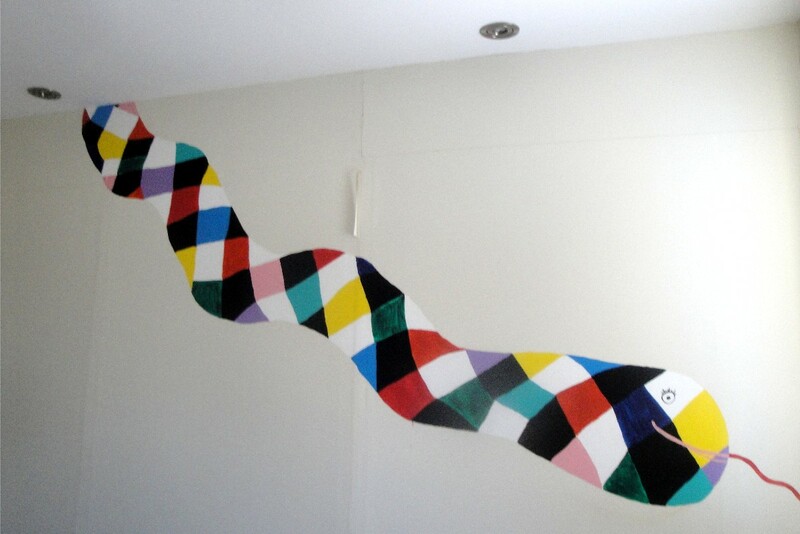 The student will compensate the remaining 3 hours by working/painting 6 hours. Project History: Though the EDEAQ considers its website in a good state, there are always elements that can be improved and/or modified. www.edeaq.com was created in 2004 and thoroughly redesigned in May 2015. It is regularly updated by EDEAQ’s Managing Director, using WordPress (WP) and Jotform (the latter for the Registration Form). – Remuneration: per 10 school hours, 7 of them have to be paid in cash. The student will compensate the remaining 3 hours by working 6 hours. Project History: 1. Proof-reading of updates of EDEAQ’s English version website. 2. EDEAQ’s website is currently in English and German. 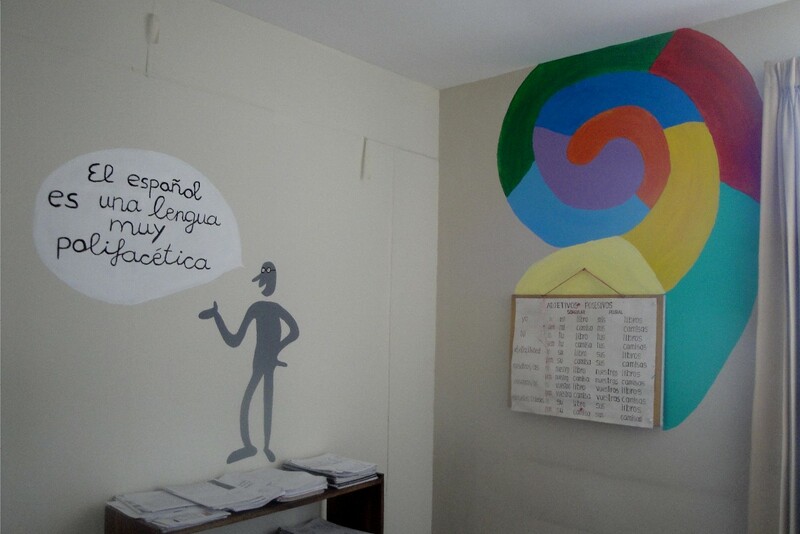 However, we believe that we should add Summary Pages in French and Portuguese. – Project Description (+ pending works): The EDEAQ will deliver a summary page text (similar to www.edeaq.com/wp/at-a-glance-summary-page), to be translated into French and/or Portuguese. Translators must be native French/Portugues speakers. – Remuneration: per 10 school hours, 7 of them have to be paid in cash. The student will compensate the remaining 3 hours by working 6 hours.